Howdy m’lady! 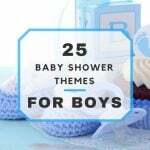 So you are having a little boy and contemplating a cowboy baby shower? 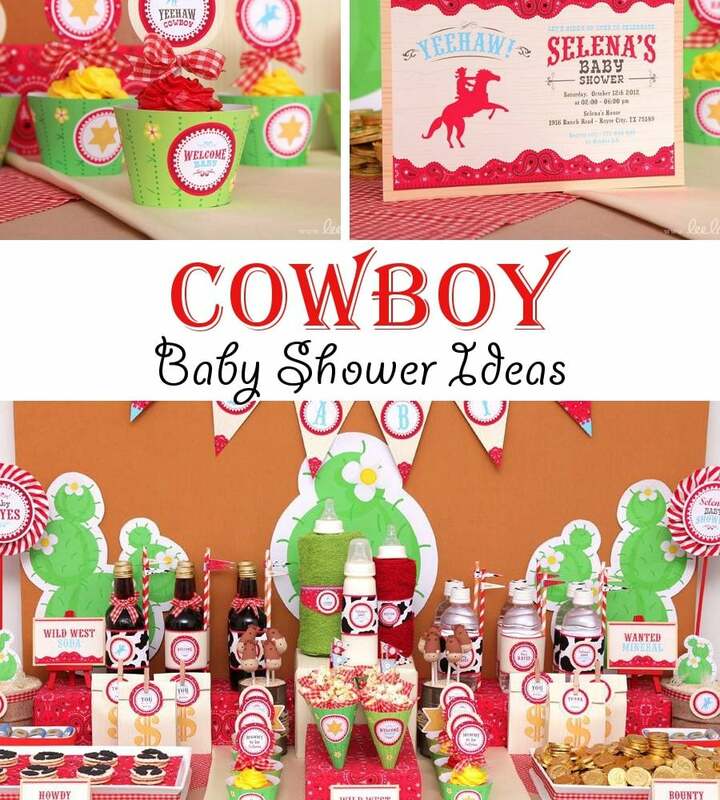 He is sure to be a little stud, so a cowboy theme is a terrific idea! 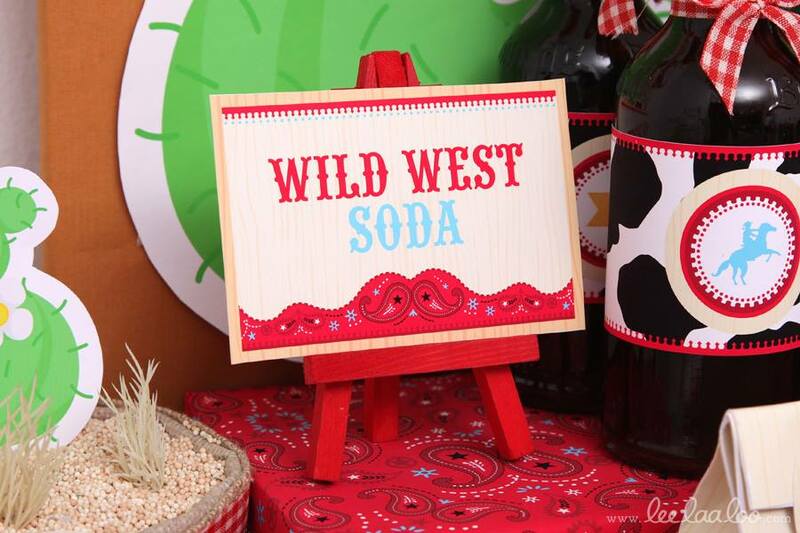 This theme will take your guests to the wild west, but before you get on your high horse with planning, I have a few things for you to consider! 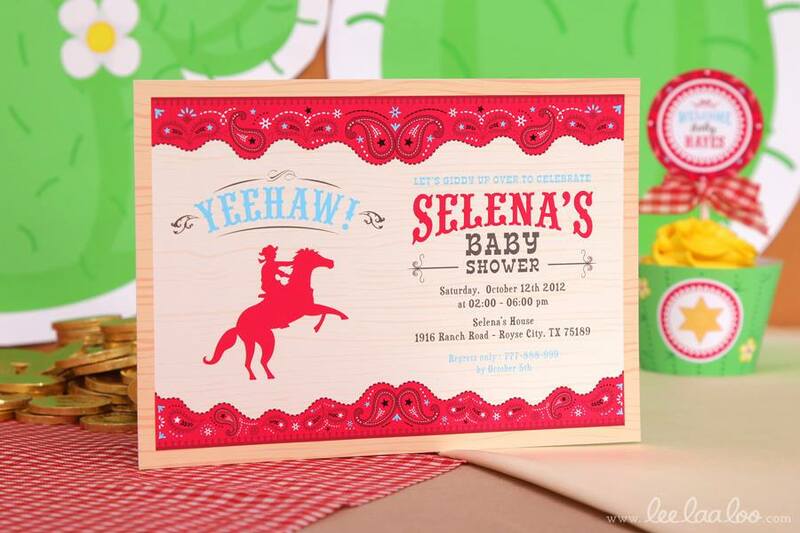 I reckon you are planning on buying those cowboy baby shower invitations from a store. Woa! Check online. It can be cheaper, you won’t have to leave the house, and you can have them customized for you so that you don’t have to hand write everything in! 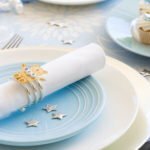 Websites such as Etsy have an abundance of cowboy themed invitations that can be personalized for you and sent to you in a digital format so that you can have them printed at the place of your choice. For just $12.00, you can buy this great design from LeeLaaLoo. Now that’s a horse of a different color! What comes to mind when you think of a cowboy? Horses, horse shoes, cowboy hats, cowboy boots, lassos, and stars just to name a few of the things. 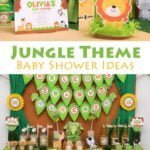 Your theme can include all or some of these things, all of which are perfect for cowboy baby shower decorations! When it comes to theme colors, typical colors schemes include blue/ brown, red/brown, and cow print and/or paisley is commonly integrated one way or another. Hay bales: Cowboys ride horses and horses eat hay, so this is a common mess in a cowboy’s territory. Even better, decorate an entire area around hay bales to make it a photo shoot area! Red bandannas: Yes, bandannas. Typical, cheap, red, paisley print bandannas. These can decorate everything from the walls, to tables, to your guests! Cowboy ensemble: No cowboy decor is complete without cowboy hats, cowboy boots and rope lassos! 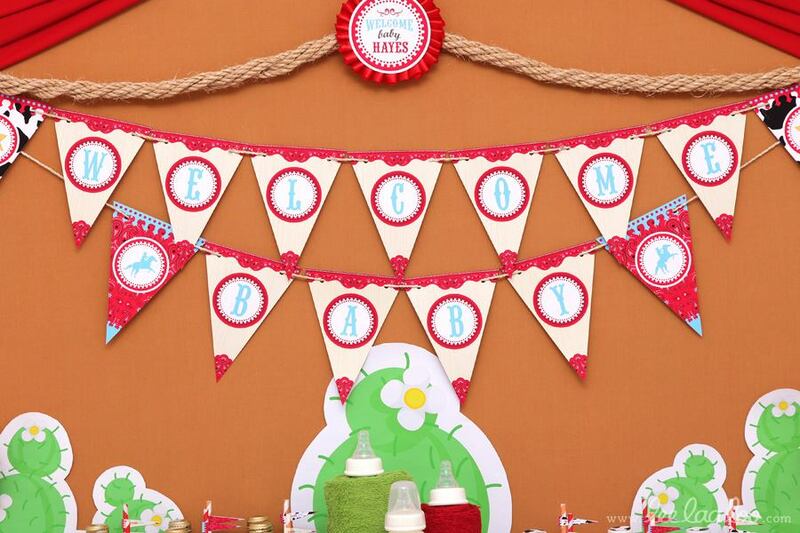 Not a single cowboy can function properly without a full belly, and your cowboy baby shower guests are no different! 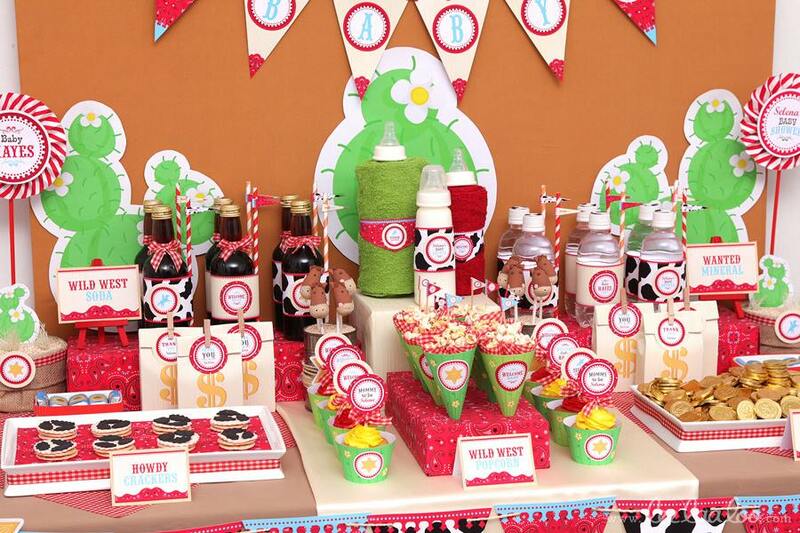 Make sure you have a good selection of cowboy-themed treats for your guests to munch on. Boot beer: Have a bucket filled with ice and bottle root beer. You can even have sticker labels customized and printed to cover the original bottle labels! Cowboy slim: You know, for those cowboys who are watching their figure. This is nothing but a very large tray of vegetables and fruit (hence the “slim” part), garnished with cowboy decorations. Simple and healthy, yet decorative! Hay bale krispies: These are rice krispy treats but instead of being cut into squares, it is rolled up and cut into “hay bales.” Be sure to bake it in thin layers, though! Candy lassos: Take stringy candy such as Twizzlers, tie them into loose knots and place them in a bowl. Easy and sweet! 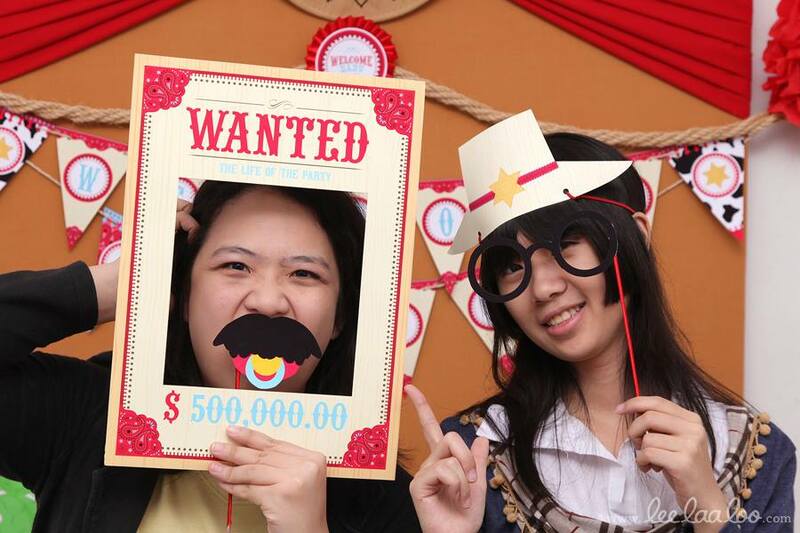 Cowboys play all kinds of fun, rugged games that we can take down a few notches to be suitable for a baby shower. Giddy up for these games because you won’t want to miss them! Lasso the trash-o: Make a lasso with a rope as shown here, and use an empty garbage can flipped upside-down. Each cowhand gets three tries and the one with the most successful trash-o catches wins! Under the hat: Line up 10 cowboy hats each with a different baby item underneath. Show your guests the items one at a time. Your guests must try to memorize the items in order and recall them in order on a piece of paper. Whoever has the most correct, starting from one, wins! Yeehaw hat toss: Using cowboy hats , your guests must land their hat in or on the appointed target, whether it’s a laundry basket or a human. Each person gets three tosses and whoever has the most, wins the game! 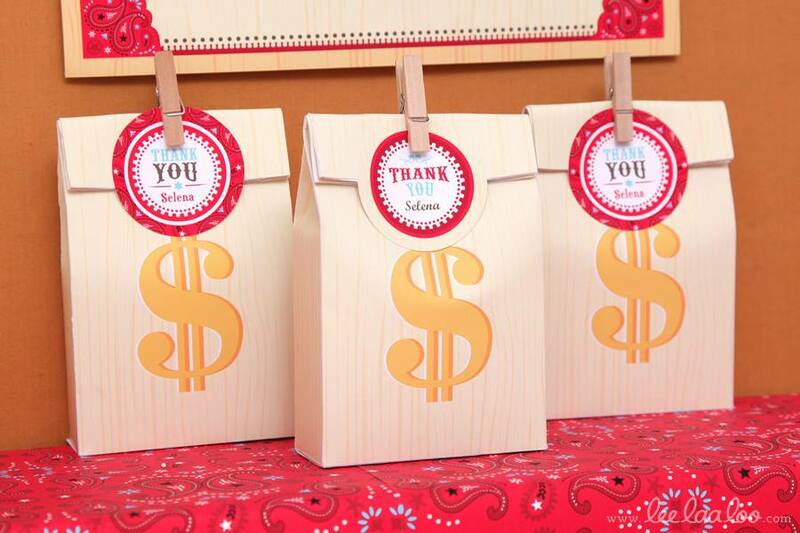 Give your guests a big cowboy “thank you” with a nice party favor to bring home. 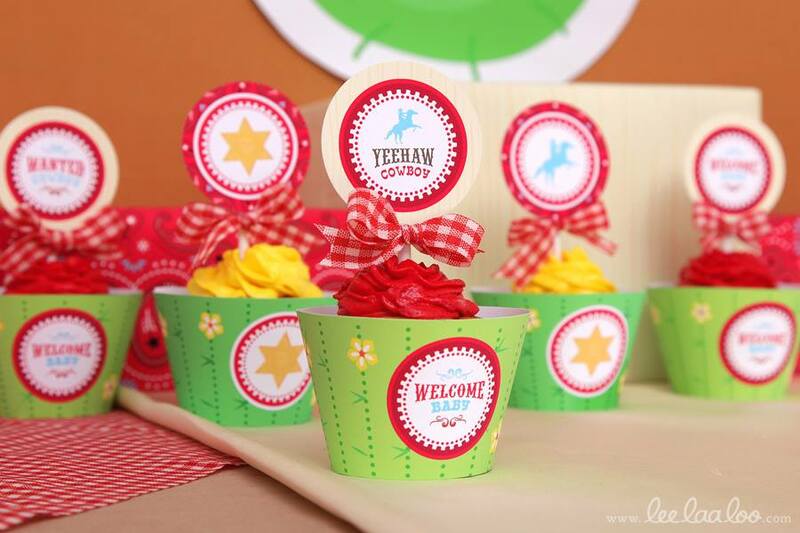 Make giddyupcakes (cowboy-themed cupcakes, of course!) and wrap them in theme-appropriate cellophane. Or if you prefer something that will last a little longer, how about handing out bandanas with little tags that say thank you? Now that you have a few more ideas, kick off your boots and get to work! Special thanks to LeeLaaLoo.com for this rootin’ tootin’ awesome design!